Press Release: More than 400 people gathered in the Sanford Sports Center recently to take part in The Incredible Back-to-School Wig Out, a fundraiser designed to support philanthropic efforts in our community. Sponsored by J. Christian Studio and hosted by Sanford, the event raised money and hair for the National Alopecia Areata Foundation, which uses donated hair to create and provide hairpieces to children with medically related hair loss. Locks of Love, an organization that provides hairpieces to financially disadvantaged children suffering from long-term medical hair loss, also received hair donations. 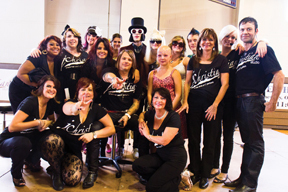 In addition to producing the show which featured entertainment and more, J. Christian’s team donated time and talent to cut and style hair and provide other services including free haircuts for those donating 8” or more of hair to the benefiting organizations. Several local businesses and individuals also contributed products and services. The hostess of the Wig Out was Laura Pellicano, a Sanford student who has Alopecia Areata, an autoimmune skin disease that affects nearly 5 million people. Laura is healthy and chooses not to wear a hairpiece; however she and her family inspired J. Christian and Sanford to support this servant leadership program to help the millions of people who are affected by conditions that result in hair loss. CulinArt, WSFS, Padi, Sherm’s, Pizza Pro, George and Son’s Seafood Market, Stacia’s Mastery Massage and Bodywork, Day Star Sills, New Castle County Women’s Journal, FastSigns, and Hockessin Memorial Hall.